You are currently browsing the category archive for the ‘Equine Competitions’ category. Excitement was in the air when we rolled in to Kentucky Horse Park to cover the 2008 Rolex Kentucky Three-Day Event. As you well know, this is the only four star event in the U.S. and as such is of great importance to the competitors since this is the event that will determine the makeup of the Olympic team for this Summer. Since this great event is the pinnacle for our U.S. competitors (even though there is great international participation) everyone expects to see nothing but the best of the best. On that Thursday April 24th we began to photograph and witness the start of the dressage competition. But as always, the excitement began on Saturday with the start of the Cross-Country competition. The morning passed by with some great rides and no major mishaps. After lunch at the media tent, we went back out to continue our coverage. At approximately 1:30 that afternoon while standing next to jump #5, (the floral basket) the reality of how dangerous this portion of the competition could be sat in on this observer. As I was watching Laine Ashker approach on the twelve year old thoroughbred Frodo Baggins a sense of something gone wrong began to overcome my psyche. Everything began occurring in slow motion as it happened. Frodo Baggins began a refusal upon approach and all of a sudden the collision between horse, rider, and the floral basket occurred. The thoroughbred hit one of the upright supports and did a somersault through the jump throwing Laine against the upright as well and both came tumbling down on the ground. The sound of the crash is one I will never forget. There was a hush over the crowd and you could have heard a pin drop. Then after what seemed to be the longest time the officials, vets, and crowd began stirring and shouting in response to this tragedy. Laine was on the ground not moving at all. Poor Frodo was struggling to get up and it was apparent that this brave horse was in pain as well as disoriented. My heart was beating in panic as I witnessed another beautiful animal in pain and a poor unfortunate rider obviously injured seriously. Frodo managed to get upright despite those next to the horse attempting to keep him calm and on the ground. Frodo managed to get up, but struggled for about five seconds and then went back down on the ground. I was in tears with the trauma I was witnessing for both animal and rider. Contrary to all reports, this witness did not see the rider move at all and then the tarps went up around the crippled horse. Since I have witnessed far too many times the tarps or curtains go up, it was apparent what was going to happen next. All of us involved with the Equine scene know that when the curtains go up, the animal is put down in spite of what anyone may say. After 1 ½ hours of delay as many riders endured the wait, the “spin-doctors” began parceling out inadequate information stating that Laine Ashker was moving and communicating with paramedics and that Frodo Baggins had been taken across the road to Hagyard Equine Medical Institute where supposedly they were working to examine the injured horse. The truth of the matter was that Laine Ashker had been taken to University of Kentucky Medical Center and was immediately put on a respirator in intensive care with serious injuries. As for poor Frodo, we were not told of anything other than the vets were working on the horse. All of the facts concerning the injuries of both horse and rider did not come out until that Monday well after the event concluded. This was done apparently to quell the witnesses’ reports of what they had seen and knew to be true. Another horse was injured and put down, as well as a rider seriously injured and in intensive care. In a separate incident, Sarah Hansel’s horse The Quiet Man sustained a serious shoulder injury as a result of a fall. The Quiet Man was euthanized Sunday morning as a result of the fall. Sarah sustained minor injuries and didn’t require hospitalization. The absence of this lovely horse is a tremendous loss to the entire sport of eventing as well. Two horses in one event are tragically euthanized. Unfortunately, this is not an uncommon occurrence and also not the only time that Laine Ashker had been involved in an injurious situation for her ride. Within the last year Laine Ashker lost not only this horse, but also her horse Eight Saint James Place staggered and then fell over and died almost instantly while being vetted after completing XC at Jersey Fresh last year under very hot and humid conditions. 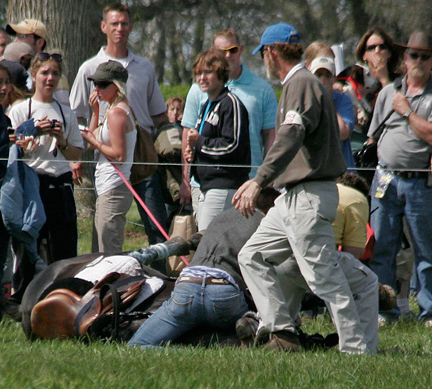 To add to the support for a safer cross-country environment, Jerome and Rebecca Broussard’s gelding, La Samurai (Sparky), who sustained an injury to his near fore suspensory ligament while riden by Amy Tryon on the cross-country course at the 2007 Rolex, Kentucky Three Day Event was euthanized on May 4, 2007. These are just four examples of injuries that resulted in the untimely deaths of gracious and noble animals in cross-country eventing. After witnessing such tragedies, one must ask if there is something that can be done to prevent such occurrences. Ask yourself, if NASCAR can implement safety features in the cars and create soft-walls at the tracks then why can’t USEF and FEI Eventing become safer? When I showed in 3-day events some 20 years ago they had a rule that in practice all riders must wear helmets. However, for the shows they ruled no helmets should be worn with safe chin straps. I can remember a fall I took where my helmet went flying and I saw the horse’s hoof over my head. I was lucky and only sustained a broken clavicle. Since that time they enforced the helmet with chin straps for shows as well as practice. But since that time the FEI and USEF took the stance that safer is better. Well in this writer’s opinion, the FEI and USEF need to take the lead and set up better standards for the implementation of safer jumps for the horse and rider alike. It’s time that the needless injuries followed by euthanasia ceases since we all take great pride in this noble sport. It’s time that our sport takes the higher road and begins to make self-improvement where needed. We can all show our support for changes in Eventing, especially the cross-country events by sending our comments either via letter, phone, or email to both the USEF and the FEI. We need to make changes much like other sports so that we can be more humane in the handling and treatment of such noble animals. 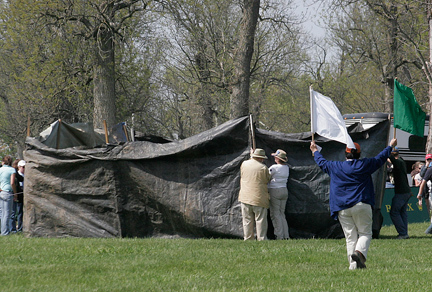 NASHVILLE, Tenn., May 1, 2008 – Nominations for horses to run in the 2008 Iroquois SteeplechaseSM have closed and Dwight Hall, director of racing, says Good Night Shirt is this year’s clear favorite. “Good Night Shirt is by far the favorite to win,” said Hall. “Last year, he got his first win of the season at the Iroquois. He then went on to break the National Steeplechase Association single-season earnings record and win the 2007 Eclipse Award. He is back in the same form, if not better, this year. “Good Night Shirt won the Georgia Cup in Atlanta, which is the only race he has run this season. He landed two lengths behind Hip Hop after the final jump, but finished strong to win by a length and a half. That performance shows why Good Night Shirt is considered to be the best horse on the circuit,” Hall added. Good Night Shirt and Hip Hop could meet again at the Iroquois on May 10. Good Night Shirt beat Hip Hop in the Georgia Cup with 16 pounds added to him as a handicap. The Iroquois is a weight-for-age race with no handicaps. Other nominations include Bow Strada, winner of the $25,000 hurdle at the Atlanta Steeplechase; Best Attack, who placed third at Keeneland; Orison, who placed fourth at Keeneland and won the 2007 Carolina Cup; and Mon Villez, a Houghland-owned horse with three consecutive victories in the Noel Laing stakes at Montpelier. Three solid allowance horses – Fra Diavolo, Kilbride Rd and Motel Affair – round out the field. Although pointed toward the 2008 Iroquois, Sur La Tete, a two-time Iroquois winner and runner up to Good Night Shirt in the 2007 Iroquois, was retired early this season because of a leg injury. Additional entries can be made until May 6 and scratches must be made by May 7. The drawing for post positions, which determines the horses’ saddlecloth numbers, will be held May 8 at 9:30 a.m. outside the barn office at the Iroquois grounds in Percy Warner Park. 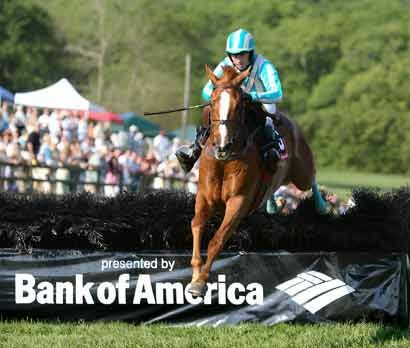 Presented by Bank of America and benefiting Monroe Carell Jr. Children’s Hospital at Vanderbilt, the 67th running of the Iroquois Steeplechase will be held May 10 in Nashville’s Percy Warner Park. The Iroquois’ race day purses and bonuses total $415,000, making it the second highest purse in American steeplechasing. Six races are held throughout the day, including the Bright Hour Amateur Hurdle. The Monroe Carell Jr. Children’s Hospital at Vanderbilt is a leading provider of pediatric healthcare, ranked as one of the best children’s hospitals in the country and among the top 10 in the nation for Emergency Medicine and Neonatology by Child magazine. Constructed in 2004, the freestanding 222-bed children’s hospital is dedicated to high level pediatric and sub-specialty treatment and is also a training and research hospital, training many of the future’s top pediatric physicians. Ranked #6 in the nation for NIH Funding, research being conducted at Vanderbilt Children’s is helping shape the way the nation cares for children. Vanderbilt Children’s is the most comprehensive children’s hospital in the State, offering services from cancer treatments, organ and bone marrow transplants to broken legs and everything in between. Living by the principal of “family-centered care,” Vanderbilt Children’s was planned over the course of five years with the continuous involvement of patients and families to ensure their special needs were addressed and met. For more information, visit http://www.VanderbiltChildrens.com. Lexington, KY—April 29, 2007—Clayton Fredericks of Australia rode Ben Along Time to victory in the Rolex Kentucky Three-Day event, presented by Farnam. Fredericks claimed his first Four Star win with a three-phase score of 54.0 penalties. Fredericks entered the culminating show jumping phase in third place behind U.S. riders Kristin Bachman and Heidi White Carty. He and his 12-year-old Irish gelding completed the jumping course with no jumping and one time penalty to put the pressure on the two leaders. Carty and Northern Spy, last year’s Reserve Champions, incurred 11 penalties to drop to a final fourth place finish with 63.0 penalties. That left it up to Bachman, the overnight leader with a score of 48.2 penalties on Gryffindor. Bachman, who had taken the lead with one of only eight faultless rounds on cross country, could afford one rail down but wound up being eliminating after going off course by mistakenly turning left instead of right after the eighth of 13 fences. O’Connor made history with her performance on the popular Theodore O’Connor, the first pony ever to ride in the Rolex Kentucky Three-Day Event. O’Connor, a three-time Rolex champion, placed third with a score of 60.1. Placing second and winning the Rolex/U.S. Equestrian Federation Four Star Championship as the highest placing American was Phillip Dutton. Dutton, a two-time Olympic team Gold Medalist when he rode for his native Australia, finished with a score of 59.1 on Connaught. Sara Mittleider, one of a record four Young Riders in the CCI****, was honored with the Reeves Trophy as the top finishing Young Rider. Mittleider, who also won the award last year, finished an impressive 12th with 74.4 penalties on El Primero. Prior to the start of the jumping phase, longtime British veteran Ian Stark was honored in a ceremony where he officially retired from the sport. Stark then rode his mount Full Circle II for the final time, finishing with no jumping and only one time penalty for a final score of 74.1 and an 11th place finish. The only Four Star Event in the Western Hemisphere, the Rolex Kentucky Three-Day Event, presented by Farnam, attracted a record attendance of 96,478 over its four days including a record 46,922 on cross country day. The competition features this country’s best horses and riders and international stars vying for their share of $200,000 in prize money and a chance at the $250,000 Rolex Grand Slam of Eventing. The winning owner is awarded $65,000 and the winning rider receives a Rolex timepiece. The classic Kentucky Julep Cup is presented to each as a reminder of their singular accomplishment. The Rolex Kentucky Three-Day Event will be broadcast on NBC television as a one-hour special on Sunday, May 6, from 5:00-6:00 p.m. EDT. 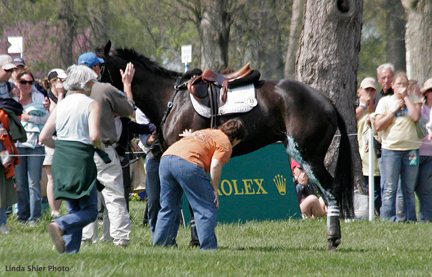 Complete unedited coverage of the 2007 Rolex Kentucky Three-Day Event is available on a set of DVDs for sale on the event’s website. We at Sports Image Times will be posting a number of follow-up articles about this great Event and those involved over the next week. Lexington, KY—April 17, 2007—Equestrian sports fans around the world will be able to watch the 2007 Rolex Kentucky Three-Day Event, presented by Farnam, as it happens thanks to the world’s first-ever full, live, end-to-end webcast of a Four Star Three-Day Event. This year’s Rolex Kentucky CCI****, an FEI Qualifying Competition and U.S. Equestrian Federation (USEF) Selection Trial for the 2008 Olympic Games, returns to the Kentucky Horse Park in Lexington, KY, April 26-29. Live webcasts of all three phases (Thursday and Friday Dressage, Saturday Cross-Country and Sunday Show Jumping) will be available online at www.NBCSports.com for a low cost of just $7.99 for all four days! Carr-Hughes Productions, producer of the NBC and international telecasts of the Rolex Kentucky Three-Day Event, will generate the programming for the webcasts. Kerry Millikin, the 1996 Olympic Individual Bronze Medalist and winner of the Rolex Kentucky Three-Day Event in 1987, will serve as the analyst for the webcasts. The only Four Star Event in the Western Hemisphere, the Rolex Kentucky Three-Day Event, presented by Farnam, is the premier competition for the top horses and riders in Eventing. Past winners include a bevy of Olympic Medalists: Bruce Davidson, David and Karen O’Connor and Kim Severson of the United States, New Zealand’s Blyth Tait, Pippa Funnell of Great Britain and Andrew Hoy of Australia. The competition features this country’s best horses and riders and international stars vying for their share of $200,000 in prize money and a chance at the $250,000 Rolex Grand Slam of Eventing. The winning owner will be awarded $65,000 and the winning rider will receive a Rolex timepiece. The classic Kentucky Julep Cup is presented to each as a reminder of their singular accomplishment. 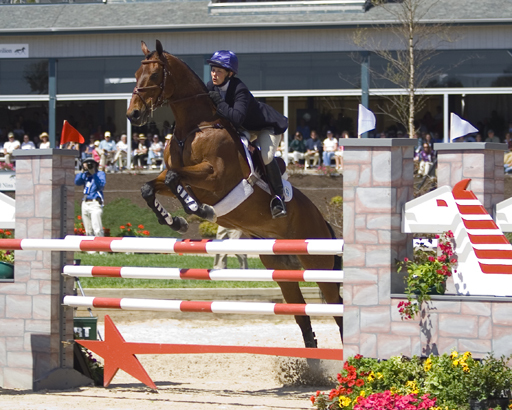 Due in part to the success and proven organization of the Rolex Kentucky Three-Day Event, the Kentucky Horse Park was chosen as the site for the Alltech FEI World Equestrian Games in 2010. This will mark the first time the Games, which feature World Championships in eight equestrian disciplines, are being held outside of Europe. For more information on the 2007 Rolex Kentucky Three-Day Event, presented by Farnam, please visit the Rolex Kentucky website at www.rk3de.org. To order the live webcasts, please go to www.NBCSports.com.